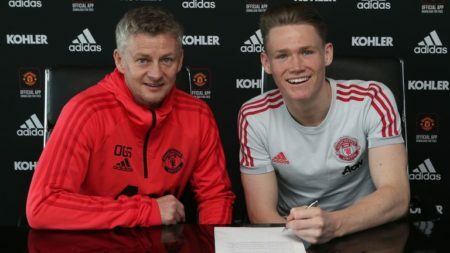 Manchester United have announced that young midfielder, Scott McTominay has signed a new four-year contract at Old Trafford with the option of a further year. The 22-year-old central midfield player has been tipped to leave the club on loan this winter with Celtic interested in his services, but it seems that he will be at the club till the summer at least. The Scottish international, who broke into the team under the management of Jose Mourinho has featured just twice under new boss, Ole Gunnar Solskjaer, and was believed to be about to be heading out on loan. However, in a massive turnaround, the young player has been assured of his long-term future at the club with this new offer, and he looked absolutely delighted after putting pen to paper. Solskjaer had on Friday confirmed that United had begun contract negotiations with the young player, highly rated by all and sundry at the club and tipped to have a big future at the club. McTominay will quickly need to win over the fans and show that he has the quality to play for the biggest team in the country. He is primarily a central midfielder known for his composure on the ball and astute reading of the game.